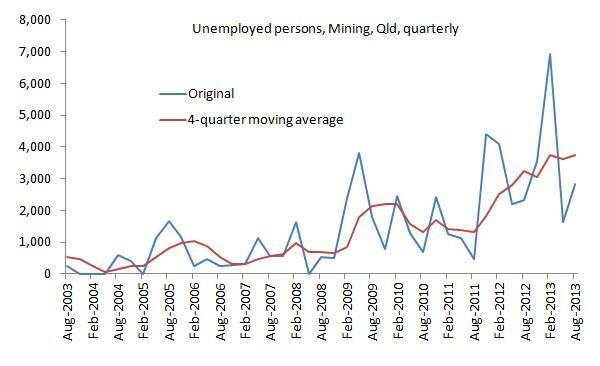 I posted last week on how the new ABS labour force data show a slowing in the growth rate of mining employment, but no decline in employment yet, as one might have expected based on reports of job losses at Central Queensland coal mines (Mining employment in Qld continues to grow, but at slower rate). Clearly there have been job losses in mining, as shown by the ABS unemployment by industry data (see chart below), but, so far, new mining jobs, most likely in the gasfields in the Surat Basin, have offset these job losses, meaning total mining employment hasn’t declined. That said, all those people who lost their jobs obviously didn’t get the new mining jobs that were created. Hat tip to a former colleague, who goes by the nickname “Toad”, for pointing out the unemployment by industry data to me. Regarding these data, the industry an unemployed person belongs to is based on their last job, full-time or part-time, in the last two years. This entry was posted in Labour market, Mining and tagged coal, csg, employment, gasfields, mining, qld, queensland, suratbasin, unemployment. Bookmark the permalink.